The name of Ernst Haeckel is inextricably linked to the theory that ontogeny recapitulates phylogeny (ORP). Haeckel was a German biologist, naturalist, and accomplished illustrator, who served as professor of comparative anatomy at the University of Jena for forty-seven years. During that time he discovered, described, and named thousands of plants and animals and was a renowned illustrator of invertebrates and a pioneer in developmental biology, studying the processes by which organisms grow and develop from single-cell zygotes to adulthood. Haeckel’s theory of ORP was based on concepts originated by the French embryologist Étienne Serres about four decades earlier. In part, Serres proposed that higher animals trace the embryological stages that are analogous to adult stages seen in lower animals. In his Origin of Species, Charles Darwin recognized the importance of embryonic development in understanding evolution, a theory actively supported by Haeckel. After studying the embryos of a number of species, in particular chicks and humans, in 1866 Haeckel proposed ORP—also called the recapitulation theory and the biogenic law—stating that the development of embryos of every species (ontogeny) fully repeats the evolutionary development of that species (phylogeny). He drew direct comparisons between slits and arches seen in the neck of developing human and chick embryos and the gill slits and gill arches in adult fish, leading to his conclusion that all three have a common ancestry. Similarly, in advanced stages of human embryonic development, a tail is present that is lost prior to birth. To support his theory, Haeckel created drawings of embryos of different species, depicting their progression from the earlier to the later stages of development and the evolvement from their similarity to diversity. These drawings, emphasizing the similarities between early stages of different species, were criticized as being oversimplified, grossly exaggerated, and inaccurate. While elements of his theory are true, ORP as proposed has been discredited and is now rejected by modern biologists. Nevertheless, many of us may have used biology textbooks that cite ORP or, more commonly, used reproductions of Haeckel’s drawings of embryos as evidence to support the theory of evolution. 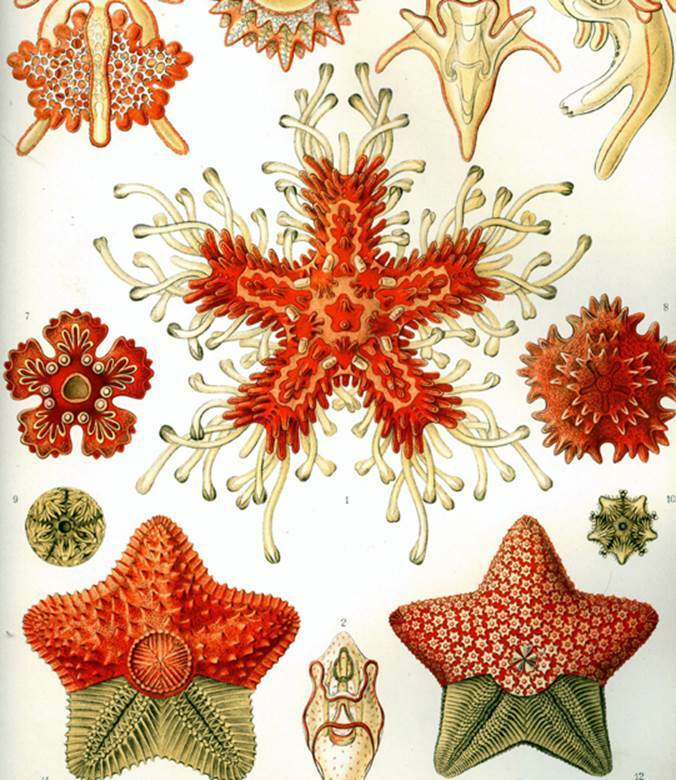 Ernst Haeckel used drawings such as this, tracing the development of Asteroidea (common starfish), in his 1904 book, Art Forms of Nature, to support his theory that ontogeny recapitulates phylogeny.